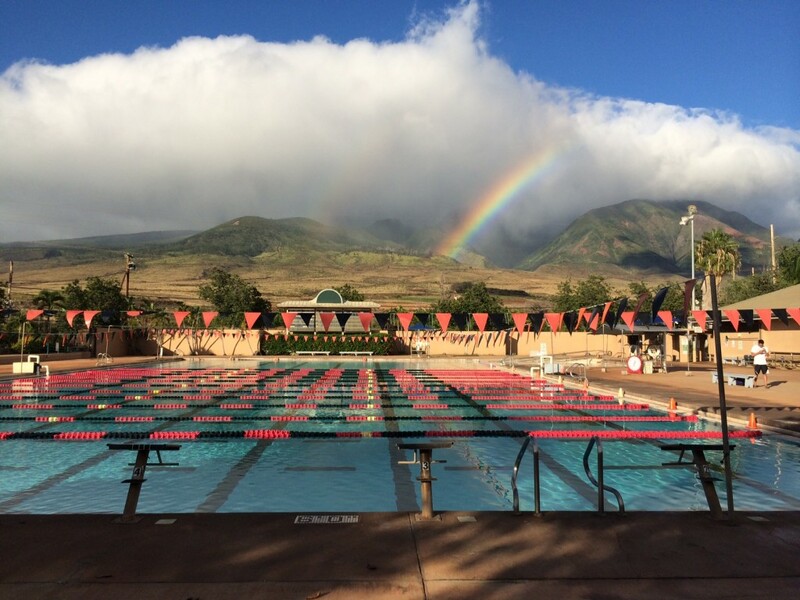 Photo taken by Valentino K. before swim practice in Maui, HI. As a young boy, I always wanted to voyage around the world. At times I contemplated what the experience might be like. In 2014, it was the year of opportunity for me. I was able to experience things that seemed impossible not only for me, but for others in my situation as a foster child. One noteworthy thing I experienced was being able to go on an expedition with my phenomenal swim team, Miami Swimming, to the awe inspiring state of Hawaii. We went there with a purpose and achieved what we anticipated. Before the trip began, I was extremely nervous. The other swimmers were already cognizant of airport screenings, but I had never been on a plane before. I had to go along with what everyone else was doing, and try my best to not look like I didn’t know what I was doing. I didn’t ask anyone for assistance whatsoever, keeping my beginner experiences clandestine. Luckily, everything went smoothly for me, and then we gradually made it onto the airplane. When I stepped on the plane, my adrenaline skyrocketed, but I still didn’t show it. It was very hard for me to travel for the first time on an airplane, but I ultimately overcame that barrier. It was awesome to see other parts of the country and I will forever recollect those places with pleasure. Once we arrived in Hawaii, everybody was woken up by the flight attendants and we immediately looked outside at the gorgeous view. I was speechless and astonished by the view. We landed and then drove to our hotel. Throughout that excursion, I observed literally everything. I have never seen mountains, actual surfers, and gorgeous beaches such as the ones Hawaii has. From my observation, I knew that I was in paradise! Throughout the duration of the trip, we experienced some amazing things, as well as rigorous physical training. We ran and swam twice a day. We even had a beach practice which felt like a triathlon with the exception of bicycles. We essentially trained like Olympians. Even though I barely completed some exercises, I triumphantly made it through. I also lost copious amounts of weight which was one of the things I intended to do. I must say, the training was very demanding, but with motivation and self-perseverance, it was feasible. I enjoyed many things while in Hawaii. I swam with indigenous fish and sea turtles and this actually rejuvenated my love for them and eradicated my fear of them. Words can’t explain this wonderful experience. The thing I relished the most was the Luau, which is a Hawaiian party/feast with entertainment. I loved how everybody on the trip came together as one big happy family. What made the night even better was to watch the sky change into a pinkish color with highlights of orange. The sun gradually retired as the lovely moon took its place. It was absolutely breathtaking. As the terminus of the trip approached, I didn’t want to leave, but hopefully I will have this opportunity next year. It was sad to see everyone depart, but we are still family regardless of where we are. Each day, I reminisce about those moments. The trip had a significant effect on me and I’m extremely thankful that I was selected for this opportunity. All in all, even though the training was exhausting, overall the trip itself was a spectacular experience. Follow Valentino this summer as he embarks on a journey of self-discovery -where he takes his first trip out of Miami, volunteers overseas doing mission work and interns with a prominent Miami-Dade County Judge! Goooo Valentino! More power to you! Proof that he who wants, can! Thank you for sharing your beautiful travel experience with such detail! Stay strong and focused and you will achieve great things in your life! Wonderful story Valentino, thanks for sharing! I can’t wait to hear how the rest of your journeys go this summer. If your talents at writing hint at what your future will bring, we can be certain it will be a very bright one! Enjoy each and every one of these opportunities life has brought your way with FRC’s backing!! !